I’m writing this post at my desk, which overlooks a barren square of backyard that is partitioned from the neighbors’ equally yellow yards with chain-link fence. I have high hopes for this ugly backyard of mine. The grass is already showing little twinges of fresh green growth, which is enough for me to start fantasizing about a little garden overflowing with herbs and cherry tomatoes. And if my sneezes are any indication, those tall trees overhead will soon come back to life. I’m really looking forward to sipping wine under a canopy of green leaves this summer. Maybe I’ll get a grill and some twinkle lights and invite my friends over for dinner. Yes, I think I’ll do that. I’m getting ahead of myself. My world hasn’t turned green yet and I’m already daydreaming about juicy peaches and long summer nights. Spring weather has finally arrived and summer’s heat will be here soon enough. I’ve been making up for the lack of green in my surroundings by filling up on green salads lately. This one is my latest favorite. It’s an explosion of spring textures, flavors and colors, all tossed in my standard zippy lemon dressing. In fact, orange carrots and hot pink radishes are so bright and spring-y that this salad almost hurts my eyes to look at. The garlicky quinoa and herbed avocado round it up to a full, satisfying meal. This salad has several components. 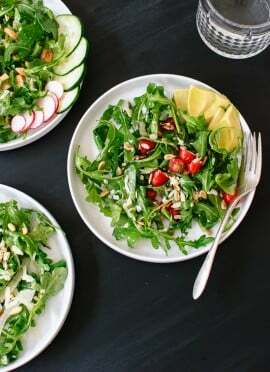 I think it would pack pretty well for lunch, but you’ll want to keep the dressing away from the arugula until you’re ready to serve (or you could switch to chopped kale, which can sit in dressing for a while without deteriorating). The avocado blend has enough citrus juice in it to keep it from getting too brown too quickly. To save time, you can make the quinoa beforehand. I like to cook extra quinoa so I can have leftovers for future salads. You’ll end up with extra vinaigrette, too. If you’re short on time, I suppose you could just slice the avocado and toss in the herbs, but it’s nice to mix the guacamole-like blend into the rest of the salad for some creaminess. I was torn on whether to write this recipe to yield two salads or four. I decided to leave it at two, but I wanted to note that the recipe will double easily. For reference, three tablespoons times two is about 1/3 cup. No need to double the dressing ingredients, as the amounts listed should yield plenty for four salads. 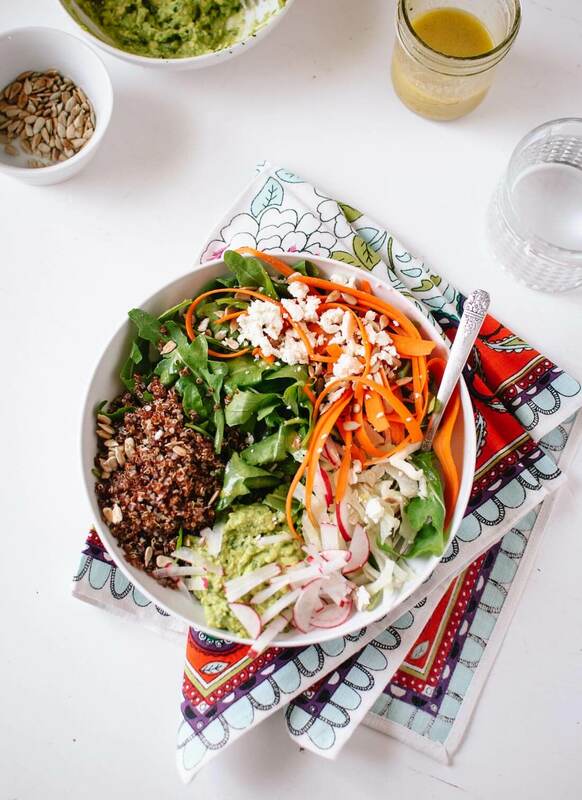 This fresh and filling springtime salad features carrots, radishes, fennel, garlicky quinoa and herbed avocado, all tossed in a simple lemon vinaigrette. The salad as written below yields two large salads—if you’d like to make four, double everything except for the dressing. To cook the quinoa: In a saucepan, combine the rinsed quinoa and 1 cup water. Bring the mixture to a boil, then cover and reduce heat to a simmer. Cook for 15 minutes, remove the pot from heat and let it rest, covered, for 5 minutes. Use a fork to fluff up the quinoa and mix in the garlic and olive oil. Season to taste with sea salt. To toast the sunflower seeds: Pour the seeds into a small pan. Heat the seeds over medium heat, stirring frequently, until they are fragrant and turning golden on the edges. Remove from heat. To make the vinaigrette: In a small bowl, whisk together the olive oil, lemon juice and zest, mustard and honey (or agave nectar) until emulsified. Season with sea salt and black pepper, to taste. To prepare the avocado: In a small bowl, combine the chunks of avocado, lemon or lime juice, chopped fresh herbs, coriander and sea salt. Mash with a fork until the mixture is blended and no longer chunky. 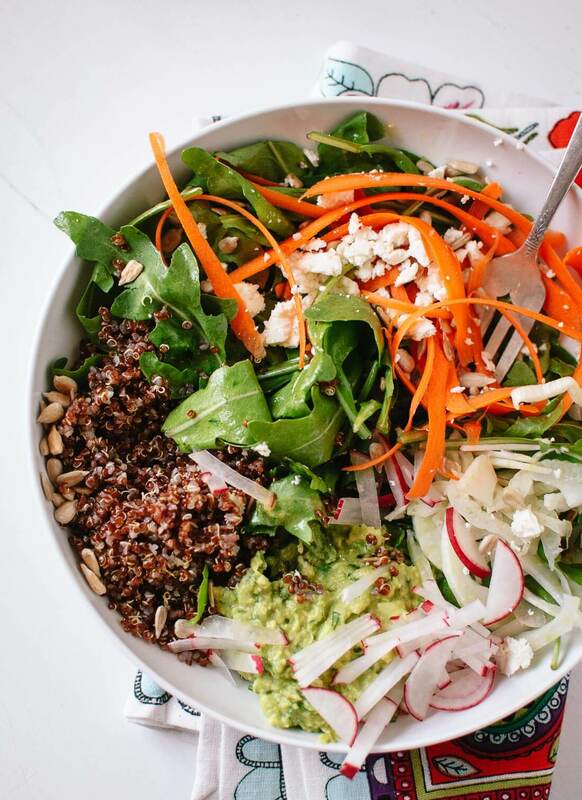 Assemble the salads: Divide the arugula and quinoa between two large salad bowls. Drizzle lightly with vinaigrette (you will have leftover vinaigrette) and toss to coat. Divide the radishes, carrots and fennel between the two bowls. Top with a sprinkling of sunflower seeds and feta cheese. Add a big ol’ dollop of herbed avocado. Serve! The salad is gluten free. Make it vegan:Use agave nectar instead of honey and skip the feta cheese. 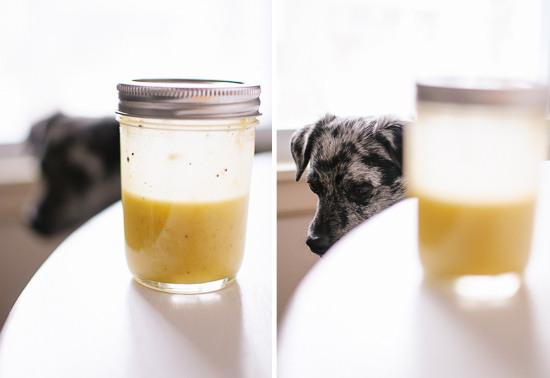 Storage suggestions: Store leftover vinaigrette in the refrigerator, covered. It should keep for about a week. If you have leftover avocado, press plastic wrap against the avocado to help keep it fresh. It’s best eaten within a couple of days—use it as a dip for vegetables or chips, spread it on toast or serve it with quesadillas. I’m reading this post while taking a lunch break and my avocado toast isn’t tasting as good as this salad looks!!! I would love to sip wine under twinkle lights right about now!!! You always have such colourful Spring recipes! This salad is no exception, and sounds so good! ahhh… lovely photos as always… the salad looks so springy, the exact colors of outfits that i want to start wearing. i also have high hopes of starting a garden, but i don’t even know where to begin. my thumb is not green at all… it’s so evil and it kills every plant it gets in contact with. i want twinkle lights, in my house and in the backyard. i think that’s a great idea! No you really are not jumping ahead, you have to think about the garden now especially if you are planting seeds. Nothing like harvesting from your own backyard right into your kitchen or sometimes into your mouth. Viva la garden! Happy Nesting. I always forget that I need to start gardening early! I should do some research and start digging. 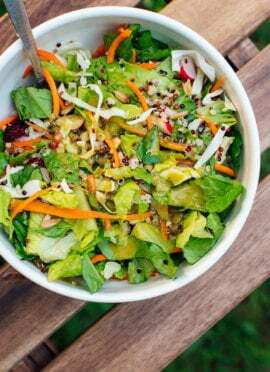 We are definitely on the same page about the spring salads, drinking wine under a canopy of green, quinoa, lemon dressing, and summer grilling! I just posted a spring quinoa salad as well! Next time I might have to add some feta, avocado, and radish because yours looks delish! This looks wonderful! I don’t have quinoa or arugula on hand but I’m thinking farro and spinach might work well, you think? Farro and spinach would be great! I’m so glad you are loving the napkins. They’re super cute. Did you order them from Pryde’s? Yes, got them at Pryde’s. They were great– excellent customer service! Awesome! That store is so great. You and I are definitely sharing brainwaves these days Kate, because I have a salad coming up on the blog tomorrow with many of these same ingredients! Just like you, things are far from green in my neck of the woods but the snow is finally melting and that’s huge progress from where we were 2 weeks ago! Even though it’s not super colourful outside, I’m loving adding more colour back into my life – both in terms of clothes and food! I’m particularly loving this avocado mixture of yours – will be trying it out for sure! I don’t know how you live with so much snow! I get so mad at snow when it lingers for long. 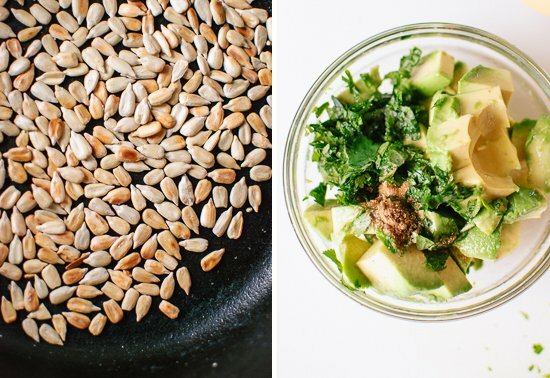 I think you will love the avocado mix. I love fresh looking salads like this… It’s definitely starting to be spring weather here… Not green yet either but the blossoms is almost done blooming and it will be a matter of days before everything is all of a sudden bright and shiny. My favorite part of spring! This is just gorgeous, Kate! I love these fresh spring flavors! Salad season!!!! Defintiely one of my favorite times of year. All the colors in this alone just make me giddy! I’ve definitely got a bit ahead of myself too; I’ve convinced myself it’s all summery out when it’s really not there yet! We’re also craving much lighter and more salad-orientated food too and this sounds perfect! 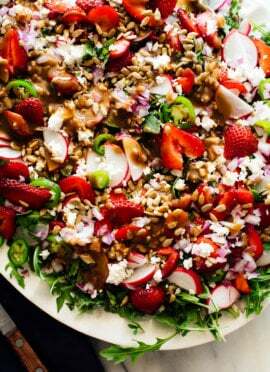 This salad epitomizes spring, I love it! Everything looks so bright, fresh and colourful! Beautiful pictures. Ooh, I would love to take this lunch to work with me, but I just can’t seem to get myself organised enough to prepare such lovely lunches before work or the night before. I know, you can’t help me with that one! Beautiful salad, though … truly! I always struggled with getting lunches ready in advance, too. Now I’m spoiled and just grab leftovers from my fridge for lunch. 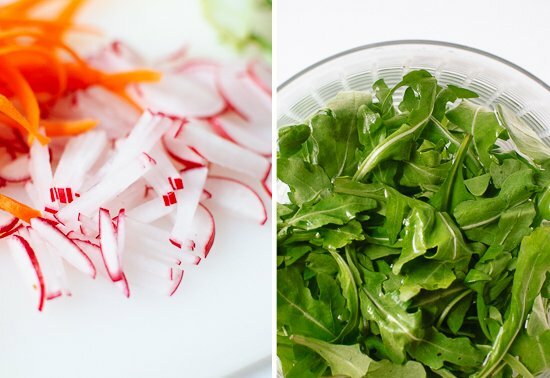 That is one UNboring salad and stunning photos to prove it! I can’t wait to try it. YUM! I can’t wait for summer too–even though I’ve got a lot of flowers around me here in the NW, produce hasn’t caught up…I’d kill for some fresh asparagus. Cindy, I’m so glad you loved the salad! Thank you for commenting to let me know! That salad looks gorgeous. Yep… I need to add more quinoa to my salads! Beautiful salad and presentation. Love the dressing. These are the kinds of salads I could eat every day and be totally content. And I hear ya regarding allergies. I’m not congested (yet) but I have a cough that won’t go away. Totally annoying. Super annoying! At least it means that spring goodness is just around the corner. This looks SO nourishing and refreshing, Kate! Mmm cannot wait to give this a try! This may be the best salad of all time. As soon as I saw the photo I knew I had to make it. I used already toasted pumpkin seeds instead of sunflower seeds. And for my herbed avocado I chose dill, chives and parsley. I am eating it at this moment and I am in heaven. Thank you for an amazing recipe. Such a fresh yet filling salad. Can’t wait to try it! Kate! This salad is so gorgeous and amazing! love the way you cut and peeled your veggies. . love my carrots just like this in my salad. And texture is a huge thing for me. . . I love the way you described it “an explosion of spring textures, flavors and colors”. . yes, indeed! beautiful. . and I am so happy we got to meet each other in MN. I was already reading your blog and now I will enjoy it that much more! Cheers and safe travels back home today! Thank you, Alice! Getting to know you last weekend was such a treat. Glad you appreciate this salad. I’m pretty particular about texture! Tell your girls hi for me. These are my favourite kinds of lunches, I can’t wait to try your recipe! Your photos look absolutely gorgeous too! Made this for dinner last night and was so satisfied. My boyfriend kept raving about how flavorful and good this was. I will definitely make this again, and be sure to double the portions so I can have seconds next time! p.s. i love the way you layout the ingredients and recipes, it makes it extremely easy to follow, especially when reading from a phone. Thanks, Ashlyn! I’m so glad you both loved the salads. I’m also happy to hear that the recipes display well on your phone. I spent a lot of time trying to make sure they display in a readable fashion. I’ve made three of your salads so far, and each time I think it’s my new favorite…OF ALL TIME. You keep out-doing yourself! I loved this salad. Also, I really appreciate the lunch-packing/left-over tips. I try to bring my lunch when I can and the tips are helpful! Hooray! Your comment made me do a little happy dance, Christina. So glad you’re loving the salads. I want to be better at providing leftover tips on every post… working on it! I could seriously eat this everyday! And I’ll definitely be trying the herbed avocado soon! Hi Randy, I’m sorry, I don’t provide nutrition details as they vary widely depending on serving sizes, actual ingredients used, etc. You can look up the recipe on myfitnesspal.com if you’d like to see their estimates. I just had this salad today and loved it! I’m so happy I made 2 servings so I can enjoy it again tomorrow. Thanks for sharing this recipe, Kate! Looking forward to trying some of your other recipes in the near future. Thank you, Jen! So glad you loved the salad. Hi Kate! I’ve been trying to get my dad, who grew up in Hong Kong and still loves greasy Chinese-American food, to eat healthier for YEARS. To illustrate how dire our situation is: he used to count the jam in the middle of a danish as a serving of fruit. I went home (San Francisco) over Memorial Day and made this salad for a family cookout. The ribboned carrots were an instant hit with Mom, but I worried that it would be a little too healthy for Dad’s liking. He LOVED it! Never thought we would get him to eat salad! Thank you! My sister doesn’t like the pepperiness of arugula, so we substituted Trader Joe’s Power to the Greens organic baby greens mix, which worked great. I also made a separate big batch before leaving using orange and purple carrots–fantastic! Love the addition of radishes! This looks delicious. Looking for healthy low calorie things to take for lunch when I start school. How many calories and carbs r in here please? Hey Kim, I’m sorry, I don’t provide nutritional information on my recipes because they vary in real life, depending on your ingredients. Please feel free to run this recipe through myfitnesspal.com for a nutrition breakdown. Made this tonight for friends. So soooooo good! I knew it was going to have awesome flavor just looking at the ingredients. I actually ended up with blending the garlic in with the dressing (with some added mayo) instead of the quinoa. My favorite part was the mint and cilantro avocado mash…don’t skip this! I made 4 smaller bowls with this recipe to go with burgers. Thanks for sharing! I LOVED this salad! Made it twice in one week. I skipped the honey in the dressing and used pumpkin seeds in stead. Great combination of favors and textures. This salad made me a follower of your recipes! Just licked my bowl clean! Thanks for the recipe and the amazing website! This salad is SO GOOD. I made it ahead of time for lunch today (keeping the dressing separate) and can honestly say it’s the best lunch I’ve had in a while. This will definitely be going into rotation this spring! Wonderful! I’m so happy you loved it, Stephanie.